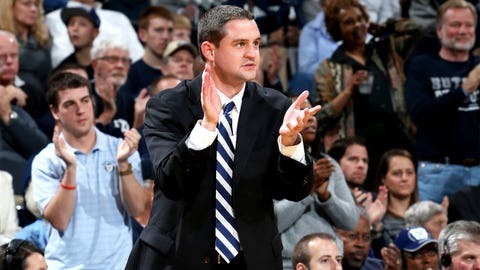 Butler Bulldogs coach Brandon Miller has the team off to a surprisingly hot start. INDIANAPOLIS — The first time I met Brandon Miller, he seemed pretty amazed at where life had taken him over the past couple years. It was late June, two months after Butler’s then-head coach, Brad Stevens, had hired Miller as an assistant coach at Miller’s alma mater. Miller was plainly thrilled to be sitting in his own office at historic Hinkle Fieldhouse. It was only one year earlier that Miller was out of coaching, spending his time driving around southern Indiana as a pharmaceutical salesman. After three years as an assistant at Ohio State, he’d decided to get out of coaching and have more time with his wife and two young sons. For that year he was grinding, driving from doctor’s office to doctor’s office, a gig not too different from recruiting. Except he wasn’t part of a team. John Groce gave Miller a chance to get back into coaching, hiring him to his staff at Illinois, then Stevens hired him back at his alma mater, a place where he’d been named one of the 15 best basketball players in the first 150 years of the school. He planned to spend summer getting to know Butler’s players and hitting the recruiting trail. These are the nation's best. Where is your team in the latest polls? A week after we sat together in Hinkle, Miller was as shocked by the news as everyone else: Stevens – Butler’s boy genius, the hottest coaching commodity in college basketball, the man who’d shepherded Butler to two Final Fours and who’d just emphasized to me how little interest he had in leaving Butler for another college job – announced he was going to the NBA. He would be the new head coach of the Boston Celtics. Suddenly, Butler was scrambling to find a new identity before the most important season in program history as the school entered the new Big East. Butler being Butler, it didn’t hire a consulting firm to conduct a nationwide coaching search. Days after Stevens left, Butler hired Miller – a first-time head coach, the point guard who led Butler to its program-changing 2003 Sweet 16 appearance his senior year, a guy from inside the program who understands what it means when people speak of the “Butler Way” – to replace Stevens. As Butler headed into the new season, I figured all the stars were aligning the wrong way with Butler joining its third athletic conference in as many years. First was the obvious loss of Stevens, who looked to be the face of the burgeoning new Big East. Then there was Miller. It wasn’t that I thought he wouldn’t be a good coach – people in the game speak highly of him – but more just that I thought it would take a while for him to adjust. The first big test of Miller’s tenure occurred during a summer basketball trip to Australia, when the team lost 6-foot-4 forward Roosevelt Jones, perhaps the toughest player in college hoops, to a season-ending wrist injury. Jones was the heart and soul of this team, a player whose funky shot, outsized heart and constant hustle embodied how Butler is a program that always seems to overachieve. I figured this would be a down year at Butler. The guys in our locker room have a unique makeup in terms of who they are as people. They’re high-intangible guys. They’re guys who like to be in that big moment. They relish being in close games. They make the plays it takes to make your team win. Eleven games into Miller’s head coaching career, he appears to have taken over right where Stevens let off. Look at the numbers and Butler isn’t particularly impressive. The Bulldogs don’t shoot particularly well. They aren’t particularly big (only one player in the rotation is taller than six-eight). But they do what Butler does: Focus on the small things. Advanced metrics bear out that this season’s Butler squad is following that “Butler Way” stereotype. KenPom.com has the Bulldogs ranked as the 31st team in the nation in adjusted defensive efficiency but ranked 259th in tempo. They’re slow but efficient. Their brand of basketball is to be deliberate on both offense and defense, force turnovers and corral every rebound. It’s the same fundamental-focused formula that’s turned Butler into the model for how a small school (enrollment: less than 5,000) without much basketball history (one NCAA tournament appearance before 1997) can become a national basketball power. When Miller talks about how Butler has achieved this hot start – a surprising 9-2 record with one of its losses by two points to top-five team Oklahoma State and the other in overtime to a very good Louisiana State team – he sounds just like Stevens. Butler men talk about their Butler Way, and it all sounds like one big cliché. Doing the little things. Focusing on the team over the individual. Playing basketball the right way. The thing about Butler, though, is this is the place where cliché turns into reality. After all, Hinkle Fieldhouse, the place where Butler’s David trained to beat all those Goliaths, also happens to be where part the movie “Hoosiers” was filmed. It doesn’t get any more cliché than that. Who are the big dogs this season? Check out all the conference standings. Boring, right? No, you’re not going to see many halfcourt lobs or posterizing dunks from Butler. What you’ll see is a team that is in every single game, one that keeps it close at the end and usually has the heart to pull out the win. This season, Butler has been behind in every game except one. You could look at the two two-point losses and say Butler is a couple possessions away from being undefeated and ranked in the top 10. Or you could look at the close wins – by three points over Princeton, in overtime against Vanderbilt, by a point over Ball State – and see how easy it would be for Butler to appear like a middling, .500 team heading into Big East play. In the Butler Way, the line between success and failure is as thin as the space that opens up between a defender and a ballhandler after a well-placed screen. This is what happens when you develop a winning culture in a basketball program. A vaunted head coach leaves and another steps right in. A star player goes down and the team keeps on chugging. A culture like the Butler Way survives the loss of any one individual, because – yes, a cliché – the team always was more important than the individual anyway. Kameron Woods is leading the Bulldogs in rebounding, but more important to Miller he’s accepted his defensive role in every game – whether it’s guarding the opposing team’s point guard or center, whether it’s defending the opponent’s star player or focusing on help defense. The player Miller identifies as the team’s glue isn’t leading scorer Kellen Dunham but Erik Fromm, the senior who is averaging only seven points but is the leader in the locker room. When Miller talks about Fromm’s plays that don’t show up on a stat sheet – holding a box-out when someone else corrals a rebound, covering for a teammate’s mistakes on defense – the definition of the “Butler Way” becomes a bit more clear. And it’s clear that Miller, the guy who was selling pharmaceuticals two years ago, is fitting right back in at his alma mater. Geez: So cliché. So fundamental. So very much the Butler Way. And exactly the reason I will never again doubt Butler’s ability to keep on chugging, no matter which pieces are parts of its puzzle.